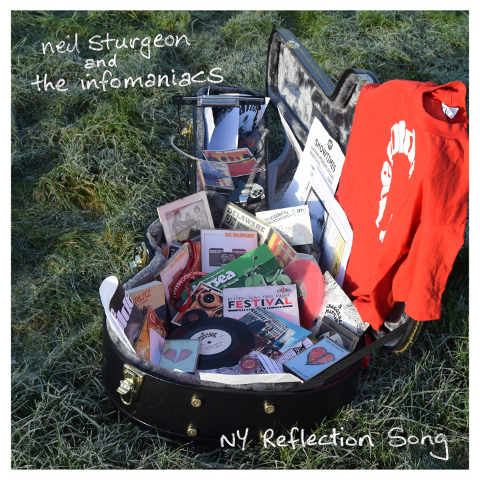 'NY' has been going down well in my solo sets in recent times and I enjoyed recording this version which 'skiffles' things up a fair bit, aided by the tremendous banjo playing and singing of Celine Donoghue and a first appearance on an NS & The Infomaniacs track by the brilliant Eivind Hodne on double bass. Infomaniacs regular Deborah Cooper plays a blinder too on the recording, contributing mighty fine vocals and a range of percussion parts (including the first ever playing of 'the spoons' on one of my records)! (EP / CD Version features three other tracks, 'The Girl Who's Never Satisfied', 'Countdown From Ten' and 'The Lookout Man').